A previously lost film noir finally gets the release it deserves. Thanks to the Herculean efforts of UCLA Film & Television Archive and the Film Noir Foundation, the movie has been restored to its full glory, and looks unrecognisable in this lush Arrow blu. Before Arrow Video's screener of 1949's Too Late for Tears arrived through my letterbox, I had considered it a movie I had already once seen. However, thanks to its previous status as a 'lost' film, the version I had watched in no way represented the movie at its best. It was on one of those Mill Creek box-sets, along with 49 other public domain films noir. The movie had not only been transferred to DVD from a VHS source, but it had clearly been taped off a TV airing, with a few frames of commercial breaks visible every 10 minutes or so. This isn't a knock at Mill Creek - I was quite happy to get to see the movie in any form - but now, thanks to the Herculean efforts of UCLA Film & Television Archive and the Film Noir Foundation, the movie has been restored to its full glory, and looks unrecognisable in this lush Arrow blu. The story opens with Jane and Alan Palmer (Lizabeth Scott and Arthur Kennedy; two of the greats!) driving through the Hollywood Hills, arguing about whether or not to attend a party as if they were Larry David and Cheryl Hines in a Curb Your Enthusiasm episode. Their bickering is cut short when a passing car ejects a leather bag into their backseat. Opening the bag, the Parkers are greeted with tens of thousands of crisp banknotes. Alan is cautious, but Jane is immediately overcome with green fever, and when a car begins to follow, she drives like a maniac in order to shake it off. That evening, the pair argue over whether or not to keep the cash or hand it over to the police. Alan agrees to place it in a train station locker for a week while they think it over, but Jane begins to behave as though keeping the money is a given, spending hundreds on expensive outfits. Returning home from a shopping spree, she encounters Danny (Dan Duryea; another of the greats! ), the hood who mistakenly gifted the Parkers his money. After receiving a few slaps from the ruthless Danny, Jane confesses to receiving the money, but lies about handing it over to the police. Danny isn't convinced, but figures it will be mentioned in the evening paper if Jane's story is true, and leaves, promising to return if the newspaper betrays Jane. It's at this point the movie begins to career down a path as twisty and danger ridden as a Californian ocean cliff route. A decade before Janet Leigh would be butchered in a motel shower, Too Late for Tears kills off a character you would have expected to play a larger role. The narrative that follows is also similar to Hitchcock's later film, with the sister of the victim (Kristine Miller, who, oddly enough, bears more than a passing resemblance to Vera Miles) believing them merely disappeared and teaming up with the mysterious Don Blake (Don DeFore), who claims to be a friend of said victim, to investigate their suspicious absence. Visually it has little in common with Hitchcock, as director Byron Haskin, best known for later sci-fi dramas The War of the Worlds and Robinson Crusoe on Mars, shoots and stages with little innovation. The striking cinematography film noir is known for is largely absent, with much of the movie taking place in blandly lit interiors. But this is a movie that's elevated by its performances and dialogue. Scott offers one of her best femme fatale turns here, genuinely intimidating as a woman so hypnotised by a bag of green she loses all of her previously existing morals. Duryea made a career out of playing hoods to such a degree that when the FBI sent their first test transmission of a fax, it was a wanted poster adorned with the actor's distinctive mug. Here he's given something a little different to do, as his tough guy wilts under the influence of Jane, driven to drink in the face of genuine evil. Roy Huggins' script, adapted from his Saturday Evening Post serial, features some real humdingers, and Scott and Duryea tear into them with relish. Aside from the distinctive faces of its chief players, Too Late for Tears won't imprint too many images in your mind, but its dialogue will stick with you long after viewing. It's very much second tier noir, but that makes it a must see in my book! 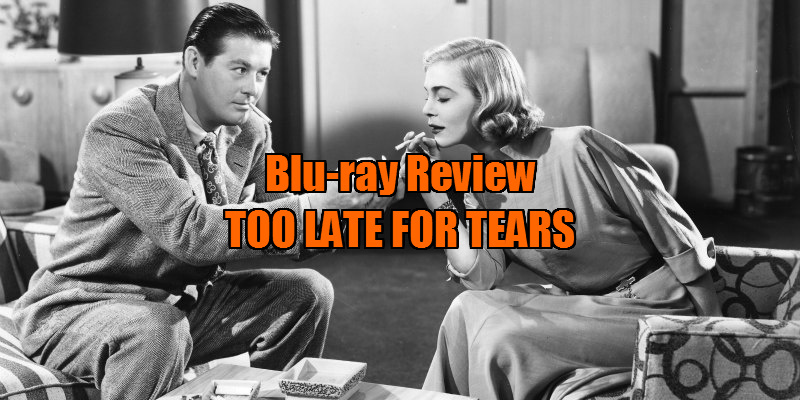 The story of Too Late for Tears' restoration is almost as dramatic as the film itself, and it's recounted here in a short featurette and an essay in the booklet included. There's a short doc featuring film noir experts discussing the film's production and the various personalities involved. An image gallery and audio commentary by film historian Alan K Rode round out a quality package.